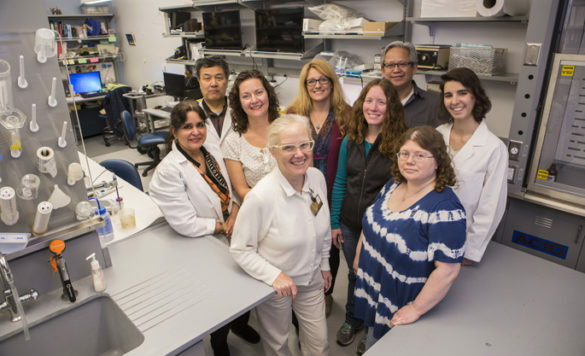 This summer the Vanderbilt Mouse Metabolic Phenotyping Center (MMPC) began its 17th year of continuous operation and federal support with a $5.5-million, five-year renewal grant from the National Institutes of Health (NIH). Based in Light Hall on the Vanderbilt University Medical Center campus with facilities in Medical Center North and the Preston Research Building, the Vanderbilt center is the oldest of five MMPCs supported by the National Institute of Diabetes and Digestive and Kidney Diseases of the NIH. The center is a local and international resource for developing new technologies and educating scientists in the tools for studying phenotypes — pathological, physiological and behavior characteristics — in mice, said MMPC Director David Wasserman, PhD. “Genetic mouse models allow us to learn how gene-environment interactions contribute to obesity and diabetes,” added the center’s Scientific Managing Director, Louise Lantier, PhD. More than 200 investigators from more than 100 institutions in 17 countries have come to the MMPC to learn strategies for studying mouse models of human disease. The center also participates in the national “MICROMouse” program, which awards competitive one-year grants up to $75,000 for research projects that have the potential to enhance and advance the mission of the MMPC as a resource for scientists using mice to study diabetes and obesity. For more information, visit https://www.mmpc.org/shared/MICROMouse.aspx. The longevity and reputation of Vanderbilt’s MMPC reflects the commitment its staff to technical excellence, innovation and education, said Wasserman, the Annie Mary Lyle Professor in the Department of Molecular Physiology and Biophysics. Wasserman pointed out that the conceptual principles used to study mice are transferable to other vertebrate animals. Thus he, Lantier, Center Associate Director Owen McGuinness, PhD, and other center faculty consult with investigators in their studies of metabolism in mice models and in human subjects. The center’s highly trained research assistants also interact directly with investigators to help plan and execute experiments and interpret results. Last month Vanderbilt hosted a two-day meeting of the National MMPC Program. Researchers and NIH officials met to discuss the program’s progress and provide updates of the latest research. The meeting featured a presentation by Stephen Woods, PhD, of the University of Cincinnati MMPC who is an internationally recognized expert on the neurobiology of feeding behavior. Mouse models enable researchers to tease out the roles of specific hormones and molecules that stimulate appetite or cause satiety — the sensation of being full. Mice can be used to establish causality for genetic variations that influence feeding behavior and how those variations may apply to the human condition. Woods described how learning — conditioning — is a major factor in determining when an animal eats and what it eats. The implication, of course, is that feeding behavior should be subject to the “laws of learning,” in humans as well as mice.